We are a technological leader in cokemaking. Our advanced heat-recovery cokemaking process has numerous advantages over by-product cokemaking, including producing higher quality coke, using waste heat to generate derivative energy for resale, and reducing environmental impact. Our technological advances have created distinct advantages that improve iron and steelmaking economics. Our ovens operate on a regenerative principle that transforms coal into a solid state carbon (coke) and volatile matter into gases. While under negative pressure these gases are thermally destroyed during the coking cycle, which reduces the environmental impact and makes the SunCoke Energy process one of the best available environmental control technologies. A horizontal bed of coal approximately 1 meter deep, 4 meters wide and 14 meters long is charged into the side of a hot oven using a leveling conveyor. Immediately after charging, the coal absorbs heat from the surrounding refractory. Volatile matter in the coal is driven from the bed and combusted, transferring heat from the combustion back into the refractory. Partial combustion of volatiles occurs in the oven crown above the bed. Gases are then drawn into sole flues beneath the oven floor, where more air is introduced to complete the combustion and provide underfiring to the oven. This permits carbonization from the top and bottom at equal rates. Overall, heat is neither gained nor lost by the refractory over a normal coking cycle. This feature allows our ovens to be a self-sustaining operation without typically requiring auxiliary fuel. We generally use large batch coal charges and 48-hour coking cycles, which minimizes machine usage, frequency of door removal and thermal cycling of the ovens. This prolongs the life of the plant and reduces operating and maintenance costs. Additionally, the oven's large thermal reservoir stabilizes the process, requiring only one combustion air rate adjustment in an eight-hour shift. Our cokemaking ovens are constructed using robust walls and arches and simply cast structural slabs, which greatly increases construction productivity and quality of work. Our unique horizontal oven design eliminates lateral expansion pressure and allows a wider variety of coal to be used. The ovens are also computer-monitored so operators can remotely assess each oven to fine-tune the coking process. Our innovative technology produces high-quality coke in the larger sizes preferred by blast furnace steel customers. Our coke also has consistently high values for coke cold strength and coke strength after reaction, or CSR. These measures are important means of evaluating the quality of metallurgical coke. Use of metallurgical coke with higher CSR values enhances iron and steel-making economics by improving blast furnace productivity. Higher coke quality enhances blast furnace permeability and allows blast furnace operators to safely increase their furnace's supplemental fuel, reduce coke charge rates and increase the volume of hot metal produced. 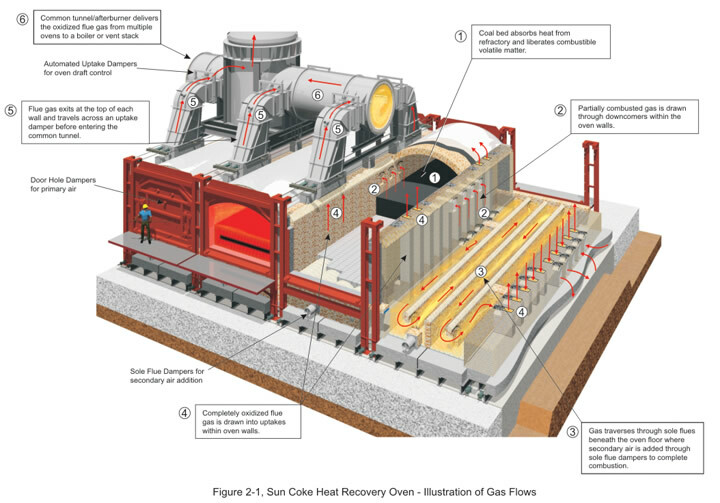 SunCoke Energy's heat-recovery cokemaking process converts waste heat into steam and electricity, which we can sell to our customers. A typical heat-recovery facility that we design and operate to produce 1.1 million tons of coke per year can generate more than 90 megawatts of electric power per hour. Sole flues and hot gas ducts provide sufficient temperature and turbulence to destroy virtually all organic compounds. The negative pressure pulls air into the oven through air ports on each oven door and sole flue, and the movement of air through the oven maximizes temperature. Excess heat is converted to steam and/or electricity through heat-recovery steam generators and steam turbines. Our research and development program is developing new technologies for cokemaking and improving our current cokemaking and heat-recovery processes. Over the years, this program has produced numerous patents related to our heat-recovery coking design and operation, including patents for pollution control systems, oven pushing and charging mechanisms, and oven flue gas control mechanisms.